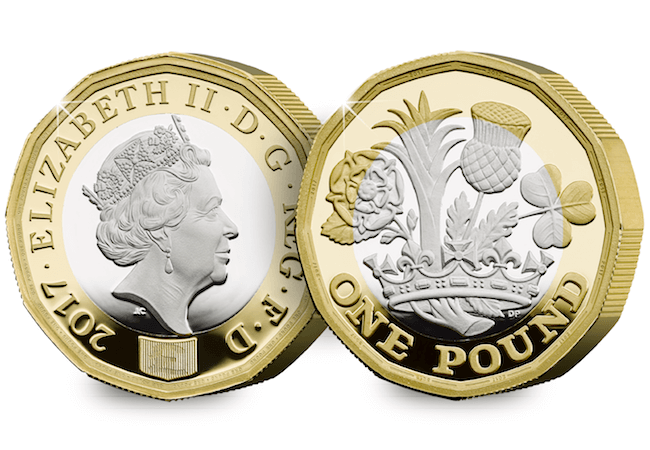 1.4 billion brand new £1 coins will be released into circulation around the UK tomorrow in what is the single biggest change to the UK’s coinage since decimalisation. To celebrate the release, we’re giving away FIVE ‘Nations of the Crown’ Silver Proof 12-Sided £1 Coins! We will draw five lucky winners out of the hat on 10 April 2017. All you need to do is take a picture of your £1 via Facebook, Twitter or Instagram using the hashtag #foundapound and the location you found your first £1 coin – it’s that easy! So good luck and fingers crossed! The draw will take place on 10 April and the winner will be notified on that day by a comment to the winners original social media post. The winner will receive the “UK 2017 New 12 Sided Silver Proof £1”. There is no cash alternative. Participants agree to meet reasonable requests to assist publicity if required. The prize draw is promoted by The Westminster Collection, trading division of 288 Group Ltd.
A. We Already have brand new 12 sided – £1 coin (x 10) from our local Bank branch dated 2016 which I have added to my change checker collection. B. We also have collected and found 14x £1 round coins of 24 designs so far still searching to complete the rest. Rose 2013 1988 Shield Anyone interested? I have already found my new pound coin at the Royal Mint on Saturday 26th March and I struck my very own new pound coin! It’s a great day out and well worthwhile going on the Royal Mint Experience tour ad then looking around the museum. I would love to find one of the new coins but none of the first locations are near me so it’s going to be a while before I find one. Let’s hope it’s before the competition ends. What happens if I don’t have a facebook, instagram or twitter account? It’s a bit onesided. I’m very much looking forward to having the new £1 coin so I can complete my album!